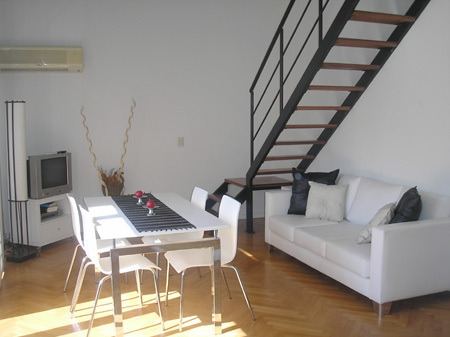 Very beautiful and bright split level one bedroom apartment located in the Belgrano disctrict surrounded by coffe-shops and very good restaurantes. Downstair there is an ample living room very tastefully decorated, a dinning area with table and chairs. High Speed Internet conection and air conditioning. Guest toilette and a fully equipped kitchen. Upstair: is a bedroom en suite with a confortable queen size bed. Highly recommended and away from the hustle and bustle of BA noise. Wooden floor, large balcony with a great view. The building has a small pool for the summer season with a sundeck and BBQ area. The apartment has cable TV, Hi-Fi system, High Speed Internet. The kitchen is equipped with gas stove, oven, juicer, coffee maker, dishes. Towels and bed linen are provided. Very good building . Elevators. Metro Station, bus routes, Universities, church, comercial area, residential area, bars, restaurants, Shopping Center : "Solar de la Abadia", cinema, banks, plazas, parks, exchange house, supermarket. Included: Electricity, gas, water, telephone and cleaning service.Cable TV, city taxes and buildind taxes, internet.